Weinberg Prof. Jacqueline Stevens, speaks to Arianna Salgado, Mark Fleming and Andrew Free about policies that affect undocumented people across the country. The Buffett Institute hosted this panel as part of its Human Rights Speaker Series. The Buffett Institute hosted a panel of experts on Thursday night to discuss “Juan Crow” laws, which are statutes that the panelists said limit the rights of undocumented immigrants. The laws’ informal “Juan Crow” name refers to historic Jim Crow laws that discriminated against black Americans in the United States. The panelists said the name is not meant to diminish the significance of Jim Crow. The panel event was part of the Buffett Institute’s Human Rights Speaker Series. 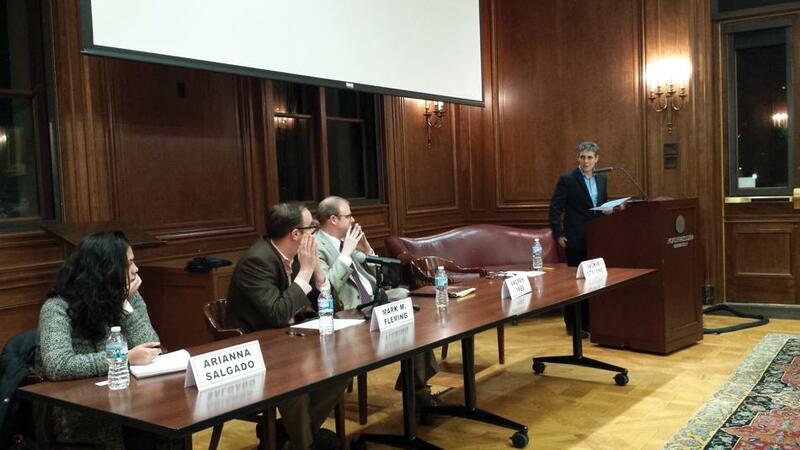 Panelists discussed state policies that affect undocumented people across different areas of the country. Political science Prof. Jacqueline Stevens, director of the Buffett Institute’s Deportation Research Clinic, said the panel was meant to bring attention to the abuse many undocumented immigrants face in the U.S.
“I think there’s a lot of student interest in the general question about deportations and this venue gives them an opportunity to hear firsthand from the people at the national and local level who are the foremost experts about what’s going on in their community and in the country on these issues,” she said. Free described several scenarios where many of his undocumented clients faced deportation and abuse due to state efforts that he said aim to cement discriminatory practices. He also said several industries that detain immigrants, like the prison system, profit from these policies. Mark Fleming, national litigation coordinator for the National Immigrant Justice Center, said that detention companies such as GeoGroup benefit greatly from the criminalization of immigrants. Fleming said it is difficult to hold the government responsible for abuse when it subcontracts companies to do the detaining. Arianna Salgado, a senior at Dominican University who has been organizing to defend immigrants from deportation since 2010, is an active member of Organized Communities Against Deportation. The organization aims to help people and families affected by deportation. She encouraged students to take action and try to reach out to communities that might need help and support. “There’s a lot of families that do need help accessing legal resources,” Salgado said.